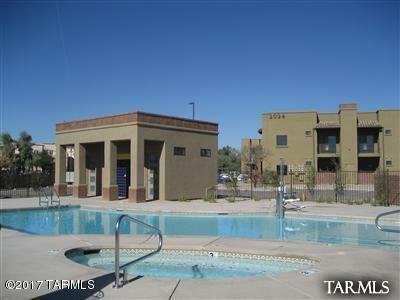 Luxury 2BR/2BA condo in a perfect central location. Upgraded kitchen features with elegant dark wood cabinetry, slab granite counter tops, glass tile back splash, and upgraded lighting and appliances. Master suite has private patio, with huge walk-in closet. Master bath has dual sinks. Both bath has tile surrounds, tile counter tops and dark wood cabinetry. Beautiful travertine natural stone flooring in living room, dining, kitchen and bthrms. Large laundry room with oversized w/d. High ceilings throughout. One reserved covered parking. Brand new w/d and refrigerator! Enjoy the resort style amenities of heated pool/spa. Close distance to shopping and fine dining at River and Campbell or take a walk, jogging or bike riding on the Rillito River Walk.